Drinking enough water is as important to our feline friends as it is for us. Proper hydration supports cat’s organs, facilitates digestion, lubricates joints, helps flush waste products, and is in general vital for many different biological functions. But how to increase water intake for fussy cat drinkers? Some cats just don’t like drinking water unless their water bowl is up to their standards – some like wide bowls that don’t touch their whiskers, others prefer very shallow dishes, and some demand running water. Whatever your cat’s preferences, know that with the right bowl, you can encourage her to drink more. To help you in your search for the best water bowl, we read hundreds of reviews, tested dozens of products and finally, came up with a top 10 water bowls for cats. Read on to get your kitty the water dish she deserves. If you’re frequently away from home, or you’re looking for a way to keep your cat’s water bowl always full, the Petmate Replendish Gravity Waterer may be the ideal product for you. This gravity waterer encourages your kitty to drink more because it conveniently refills the bowl with clean water every time he drinks it. The system has a replaceable charcoal filtration system that removes or reduces many harmful compounds, including sediment, volatile organic chemicals and chlorine, so your pet is always sure to have clean, good-quality water. The bottle is made of PET plastic, and the base, which is dishwater-safe, features Microban Antimicrobial Protection that helps prevent the growth of bacteria and stain. A high-quality raised food and water bowl for cats, the Necoichi (“cat first” in Japanese) is a perfect product for all those fussy feline water drinkers. The bowl is made from heavy-duty ceramic that is designed to meet all FDA, EC & ECC standards, and is both dishwasher and microwave safe. In other words, not only is this elevated dish designed to provide maximum comfort for your cat while drinking, it’s also super-easy to clean and take care of. The base of the bowl is wide so the water is sure to stay centered and hard to knock over. Furthermore, the bowl has an inner lip to prevent spillage, so you don’t have to worry about the mess with this particular cat dish. 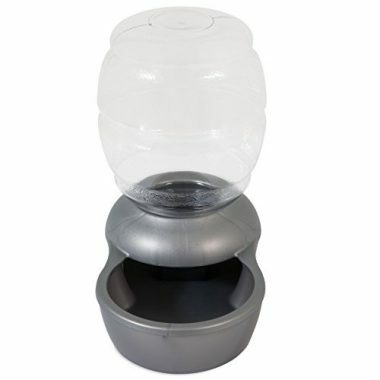 The PetSafe water station is a gravity water feeder, meaning it refills water every time your kitty drinks it. This translates to fewer manual refills and more time for you, a busy pet parent. The station itself is quite sturdy, as the reservoir is made of durable BPA-free plastic and there are locks to keep everything together and the station from tipping over. As for the bowl, it’s made of stainless steel, meaning it’s hygienic for your pet and easy to clean (dishwasher safe) for you. The product also has a Flow-Control Valve to prevent water from spilling during refilling and carrying. 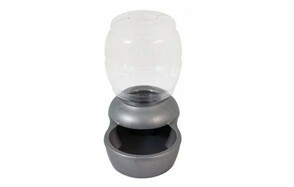 And if you’re interested in a purifying filter, you’ll be pleased to know you can buy one separately for this product. If you need an affordable, lightweight, portable water bowl for your feline pet, make sure to check out the Comsun bowl. 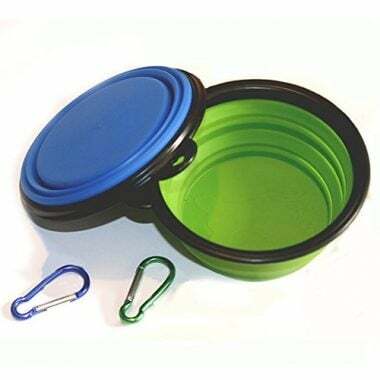 Made from eco-friendly materials (flexible food-grade silicone) that are BPA-free, durable and reusable, this water bowl is easy to pack and carry with you and your cat anywhere you two go. Not only that, but it’s easy to clean, as all it takes is rinsing and/or wiping after use. Pretty small and lightweight, the Comsun is guaranteed not to take up a lot of space, so it’s ideal for cat owners who live in smaller apartments. 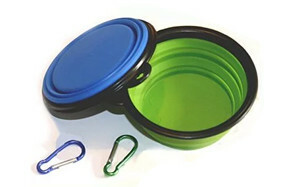 The bowls come in blue and green colors, with a lifetime warranty. A sturdy, high-quality double bowl by Pawfect Pets is one of the best elevated cat bowls on the market. The bamboo-wood stand keeps the cat’s food and water raised above the floor to prevent spillage and mess and makes eating and drinking more comfortable for tall cats, as they don’t have to crouch in order to eat and drink. There are silicone rings in the stand to keep the dishes securely in place and prevent bowls from clanging and your pet from knocking them over. The set comes with four stainless steel bowls, which are hygienic for your kitty, and convenient for you as they’re easy to clean and are dishwasher safe. Affordable, good-quality double bowl? 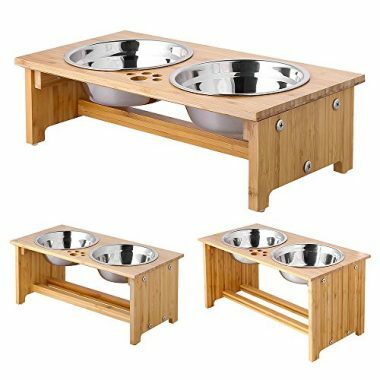 Yes, the Upsky has got you covered – this set features a high-grade resin station and two stainless steel bowls, perfect for cat food and water. 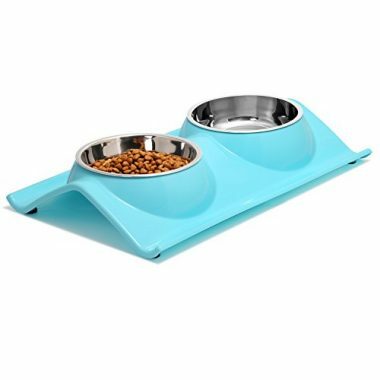 The construction prevents water and food spillage as the raised mat is made from no-spill, environmentally-friendly resin, so even if your kitty is a super-messy eater, you don’t have to worry with this set. If you’re wondering about the height of the mat, it’s 0.8 inch high, which makes it ideal for cats of off sizes and ages. The bowls themselves are removable and easy to clean as they’re dishwasher safe. The cat food and water bowl by Our Pets is a simple, high-quality, minimalist in appearance dish that will encourage your kitty to drink more water while sparing you from cleaning the mess. 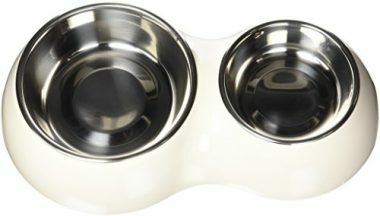 The bowl is made of heavyweight, good-quality stainless steel, which means it’s easy to clean as it’s dishwasher safe. To encourage cats to drink more water, the bowl has lower sides to make the food and water more accessible. And at the bottom, there is a patented rubber stand that prevents the bowl from skidding and your pet from knocking it over. A word of advice – some users complain the bowls are smaller than they should be, so pick a slightly bigger dish than you normally would when purchasing. The Catit Double Diner features an adorable but highly functional design that makes eating and drinking comfortable and easy for cats of all sizes. There are two stainless steel bowls – one is smaller and the other one bigger - that can be used for food and water. The outer dish, made of plastic, is slightly elevated so it allows proper posture while drinking. It also hugs the bowls tightly so they don’t move around or clank. As mentioned, the double bowl is made of stainless steel, so they’re sure to last a long time. They’re also easy to clean as they’re removable and can be washed in a dishwasher. If you’re looking for a functional and beautiful design that both you and your feline friend will love, along with two easy to clean bowls, definitely try the Foreyy set. This product features a stand made from bamboo tree that has high water resistance properties, as well as two stainless steel bowls that are dishwasher safe. The base is elevated with anti-slip feet that make the set stable and hard to knock over. There are also removable anti-slip feet around bowl holes to prevent clanking while the cat is eating or drinking. The set comes disassembled, but with instructions that are easy to follow. And if for some reason you’re not satisfied with the product, the company has a 100% money back guarantee. 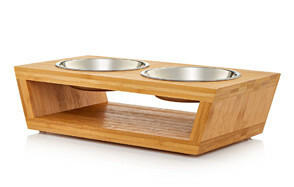 The PetFusion’s pet feeder is one of the best-quality elevated feeders on the market. 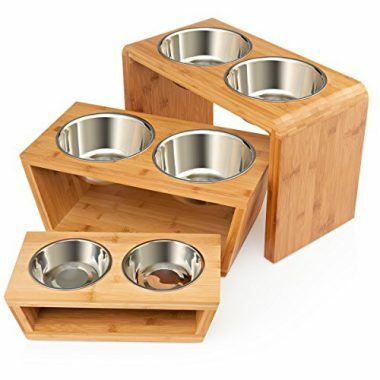 Made of durable, sturdy materials, with great attention to detail, this set is sleek and pleasing to the eye, guaranteed to last for years, and makes drinking and eating super-comfortable for your kitty. The base of the feeder is made of anodized aluminum, which is highly corrosion-resistant (even more than stainless steel!) and is color-infused so that it doesn’t chip. There are anti-slip feet and bowl insets to keep everything stable and in place at all times. All in all, the base is very durable, lightweight and easy to clean. As for the bowls, they’re easy to remove and clean, and you can even put them in the dishwasher if needed. Drinking enough water is essential for feline’s health, but some cats appear to have missed the memo. They either drink too little or barely any water at all – if that’s your cat, you know the struggle of making a stubborn furry animal do something she doesn’t want. Luckily, a right cat water dish can turn things around and help you keep your kitty healthy, happy fand hydrated. The only problem? How to pick the right watering bowl. With so many different products on the market, it’s easy to get lost in a huddle and feel confused about what’s best for felines. There are simple, traditional kitten bowls, cat water fountains, raised water bowls for cats and just so many different products, it’s hard not to feel overwhelmed. But that’s why we’re here – to help you find the best of the best for your pet. In this buying guide, we’ll discuss all different types of water containers for cats, what to consider when looking to purchase, and indeed, what makes a good cat bowl. Make sure you also read our answers to commonly asked questions, as they can help you make a truly informed purchase. So let’s start with your cat’s likes and dislikes. If you’ve noticed your cat prefers drinking from wider dishes, make sure you take that into account when making a purchase. Some cats hate when their whiskers touch things, which is why they may drink only from wide bowls. On the other hand, if you’ve noticed your kitty likes to push things around, including his water bowl, it’s best to avoid lightweight watering bowls to prevent spillage and overall mess. What about your cat’s personal preferences? Like people, some animals have quirky preferences, and that should be okay. For instance, you may purchase a great-quality water bowl that you love the look of, but your cat may – well, hate it. Things like this happen, and it’s not wise to force an animal to change its habits. So, if your kitty is a creature of habit, make sure his new water dish looks similar to the old one – this should make the switch easier. It’s important to get a watering bowl of good-quality. The material should be long-lasting, safe for cats and easy to clean. It’s never a good idea to buy a water dish that’s not safe for animals, such as BPA-containing plastic or materials that quickly absorb odors and are bacteria-friendly. The general advice is to look for materials that are durable and pet-friendly, such as stainless steel, ceramic or BPA-free siplastic. And finally, think about your own convenience, meaning money and maintenance. Sure, it’s not hard to find a great-quality cat bowl that looks fantastic and fits your decor and your feline companion likes – but does it fit your budget? If the watering bowl costs more than you’re willing or able to spend, simply look further – it’s absolutely possible to find a great water dish that you and your cat will love and that also fits your budget. Also think about cleaning – it’s a huge bonus if the bowl can be washed in a dishwasher (which is why most of the reviewed cat water bowls in this article are dishwasher safe), but it’s not an absolute must. Ultimately, you want a kitten bowl that is easy to clean, so if all it takes is a little soap and water to make it sparkle, that’s ok. However, if you hate manual washing, it’s wise to pick the dishwasher-safe product so your kitty can always have clean water. There are four main types of water bowls for cats: traditional, self-filling (gravity waterer), cat water fountains and raised bowls. Simple, no-frills water bowls, or traditional cat water bowls are the most common types of kitty bowls. They’re affordable, easy to clean and safe to use (though this depends on the material). Many cats are perfectly ok with plain water bowls and will happily drink from them – however, there will always be those finicky felines who prefer their water with a little bit more jazz. For instance, some cats will simply refuse to drink from a dish of standing water if it’s not perfectly fresh and clean. If that’s your kitty, move on to one of the following water bowl types. If you hate re-filling your cat’s water bowl, or you’re often away from home, a self-filling waterer is an excellent choice. 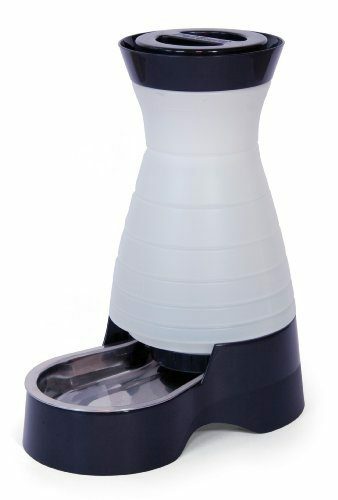 These waterers are super-convenient for you and your pet, as the bowl keeps re-filling itself as your cat drinks. This means more time for you, and more clean water for your cat. Granted, it’s not fresh water that’s getting topped up, but at least it’s cleaner than the water that’s been sitting in a bowl all day. Plus, some waterers have filtration systems that actually make water cleaner, safer and overall better. Some cats refuse to drink standing water no matter how fresh. This is actually understandable, as felines instinctively know that stagnant water in the wild comes with risks (bacteria, infections, poison, etc.). These kitties will avoid still water like the plague but will gladly drink from taps and other running-water places. Clearly, you can’t always run to the bathroom to turn on the water for your thirsty cat – it’s not practical and it’s not comfortable for your cat. But getting him a cat water fountain? Probably the best idea. These waterers are usually driven by small electric motors that keep the water circulating. Some cat water fountains contain filters to keep the water as clean and fresh as possible and some can even cool the water – perfect for those scorching hot summer months. If you’re interested in these systems, check out our recommendations for the top rated cat water fountains. 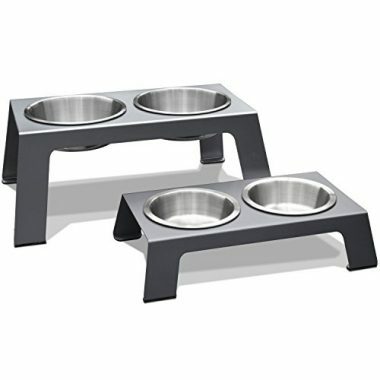 An elevated cat bowl is not a bowl type per se, as both traditional and self-filling waterers can be elevated, but don’t have to. Regardless, it’s good to mention raised cat water bowls as well, as they’re particularly helpful for kitties with certain health issues. 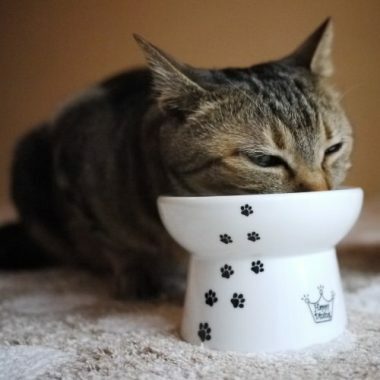 If your feline friend is an elder or has joint pain, a raised cat bowl can make him more comfortable while drinking. Because the cat doesn’t have to crouch down while drinking from a raised water dish, joints and bones are spared the strain and pressure. Furthermore, elevated waterers improve digestion as they’re the height of your cat’s chest while standing. A: Although cats have evolved to be thirst-tolerant, hydration is of utmost importance to feline’s health. As mentioned, being properly hydrated is crucial to cat’s various biological functions, so encouraging your kitty to drink more water is always a good idea. But what happens when a cat doesn’t drink any water for days? Maybe you found a stray kitten and don’ know how long it’s been since she had any water, or maybe your cat run away and you’re not sure if you should visit the vet. In any case, how long can a feline go without drinking water? Its diet: cats eating only dry food require much more water than those eating wet/moist food. As you can see, how long a cat can go without water depends on a wide array of factors, but since water is the most important thing when it comes to cat health (it’s even more important than food when it comes to basic body functions! ), it’s obvious a feline can’t live without any water longer than a few days. Experts agree cats can survive for a maximum of several days -four to five – without drinking any water, after which they will experience hepatic failure and die. Q: What is the best material for water bowl for cats? A: When trying to find the best water bowl for your cat, it’s crucial to consider the material the container is made from. Most cat bowls are either made from plastic, metal or ceramic. Pros: cheap and convenient, plastic bowls are easy to come by and use. They can be wide and large, narrow and small and everything in between, so it’s easy to find the one your cat prefers. Some are sturdy and fixed, others are collapsible and easy to take with you on the travels. Since they’re the most affordable of the three, it’s not too much of a waste to try a few different bowls to find the one your cat loves the most. Cons: some plastic water bowls are not safe for long-term use as they can crack easily and allow bacteria to grow, and some can even start to degrade after a while. This can cause cat rashes and allergies. Also, most cheap plastic bowls start absorbing odor over time, which can discourage your kitty from drinking. Therefore, if you’re looking for a plastic water bowl, make sure it’s high-quality, BPA-free and food grade plastic/silicone. Pros: metal bowls are usually made from stainless steel which makes them high-quality, safe, easy to clean (most are dishwasher safe) and comfortable to drink from (they don’t absorb odors!). Most cat bowls on the market are made from stainless steel, so finding the one your kitty loves shouldn’t be a problem. Cons: some metal bowls are very lightweight which makes them easy to knock over. However, this entirely depends upon the model of the bowl, as some have anti-slip feet and are quite sturdy. Pros: like a stainless steel bowl, a ceramic dish is perfectly safe, of great quality and is easy to clean. Another plus is that these water dishes are a bit heavier than metal bowls, which makes them more difficult to knock over. For these reasons, a huge number of cat water bowls on the market are made from ceramic, so finding your and your cat’s favorite should be easy. Cons: like plastic bowls, ceramic dishes can also crack and develop places that allow bacteria to grow. Also, some glazed ceramic bowls may contain lead and other harmful compounds, but it’s important to note that most modern ceramic dishes are perfectly safe. Q: What are the safest cat water bowls? A: As you can see above, all cat water bowls have their own pros and cons. However, it’s clear that some waterers are safer than others. Generally speaking, if you’re looking for the safest cat water bowl, you want to focus on either stainless steel bowls or ceramic bowls. Stainless steel water dish is unbreakable, super-easy to clean thoroughly, and doesn’t absorb odors. Likewise, a ceramic water bowl is easy to clean, it doesn’t absorb smells and is difficult to knock over. Good-quality plastic bowls are also safe if they’re made from food-grade plastic, but it’s best to replace them every few months or so. The verdict? The safest cat water bowls are stainless steel and most ceramic dishes. A: While whisker fatigue may sound like something made up, we assure you it’s a real condition that affects many cats. To explain it, let’s talk about cat whiskers first. The long, thick hairs growing on your cat’s face are not there to make your pet look cute (though we must admit, they do add to feline’s overall adorableness); they have a real, important function. Equipped with a special organ called proprioceptor, the whisker’s role is to detect changes in the outer environment, which is what allows your cat to respond even to the slightest vibrational changes in the air and hunt and move in the dark. Because they’re so sensitive, whiskers can get fatigued or stressed when over-exposed to stimuli. So, if your cat’s whisker hairs are frequently touched involuntarily, such as during the time she eats and drinks from the narrow bowl, she can become over-stressed, irritated and even lose her appetite. To prevent whisker fatigue, get your cat wide and shallow food and water bowls that do not touch her whiskers. Q: Where should I place my cat’s water bowl? Place the bowl away from food dish to make your feline companion act as she would in nature. Far away from the litter tray. A: If given a chance to drink from a bowl containing fresh water and a bowl containing stale water, all cats would choose the fresh water – no exceptions. Therefore, to encourage your kitty to drink more water, it’s crucial to change her water bowl regularly. In general, it’s best to change a pet’s water dish two to three times a day, but if you don’t have the time to do that, once a day is also good enough. It’s also advisable to clean your cat’s water bowl every day – if the bowl is not dishwasher safe, soap and hot water work fine. Of course, if your kitty has its own self-filling waterer or a water fountain, there’s no need to change the water that frequently, especially if the system has some form of a water filter. In that case, changing the water every couple of days is more than enough. A: The size of your cat’s water bowl depends on his size – generally speaking, the bigger the cat, the bigger the bowl should be. However, it’s always a good idea to buy wide and shallow water bowls, to avoid whisker stress. If you have two cats but one water bowl, make sure it can hold enough fluid for both of them.